TokenMarket has announced that it will be hosting the second of its security token offering meet-ups in the UK, titled 'The Evolution of Security Token Offerings'. After two highly successful meet-ups in both London and Singapore which outlined what security token offerings (STOs) are, the award-winning advisory and token issuance platform have now sought to explain how these offerings will evolve in the future. The event will see TokenMarket Vice President of Business Development, Ryan Hanley, host a panel of industry professionals discuss where the STO market is heading for 2019. With Thomas Power, Member of the Board of Directors at software company 9 Spokes, already confirmed as a panellist, the panel has already set a high standard. Expect more panellist announcements to come in the coming weeks via TokenMarket's social media channels. 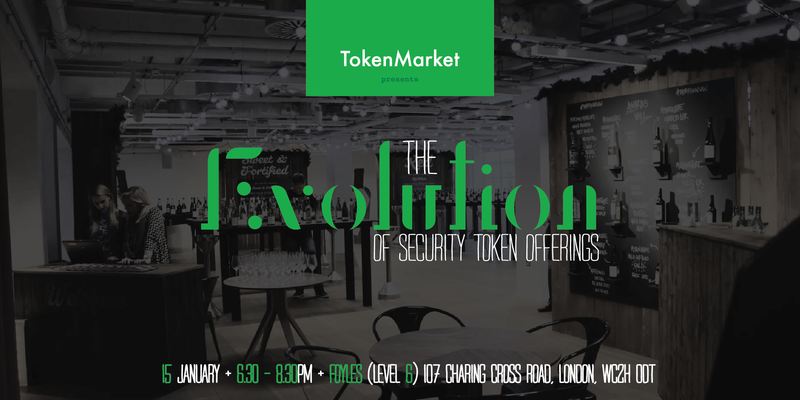 TokenMarket would like to invite all blockchain, fintech, cryptocurrency enthusiasts and professionals to join us for complimentary drinks, food and discussion around how the evolution of security tokens can help to revolutionise the crowdfunding space. "Whilst our previous events explained the differences of STOs in comparison to ICOs, this event will be different. Our panel of seasoned blockchain and crypto veterans will delve deep into the world of security tokens and explain what is needed for the market as a whole to thrive in the forthcoming year. I am excited to welcome back so many of our previous attendees to discuss the further development of the STO market." Register for tickets to 'TokenMarket Presents: Let's Talk Security Token Offerings' HERE. TokenMarket received confirmation in September 2018 that it would join cohort four of the FCA Regulatory Sandbox to test and measure the implementation and the practice of tokenising equity in the UK. TokenMarket will provide insight and use cases on how tokenisation can deliver as well as how the market as a whole needs to evolve in order to be a success in 2019. This new asset class, kept solely on the blockchain, will allow investors to bring their shares in a company into the 21st Century.